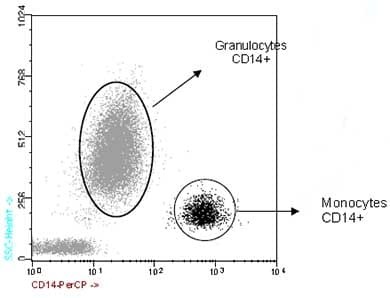 ab91146 reacts with human monocytes and macrophages; weak reactions may occur with neutrophils. Human lung angiotensin converting enzyme. Our Abpromise guarantee covers the use of ab91146 in the following tested applications. Flow Cyt Use 20µl for 106 cells. ab118658-Mouse monoclonal IgG1, is suitable for use as an isotype control with this antibody. Cooperates with MD-2 and TLR4 to mediate the innate immune response to bacterial lipopolysaccharide (LPS). Acts via MyD88, TIRAP and TRAF6, leading to NF-kappa-B activation, cytokine secretion and the inflammatory response. Up-regulates cell surface molecules, including adhesion molecules. Expressed strongly on the surface of monocytes and weakly on the surface of granulocytes; also expressed by most tissue macrophages. N- and O- glycosylated. O-glycosylated with a core 1 or possibly core 8 glycan. 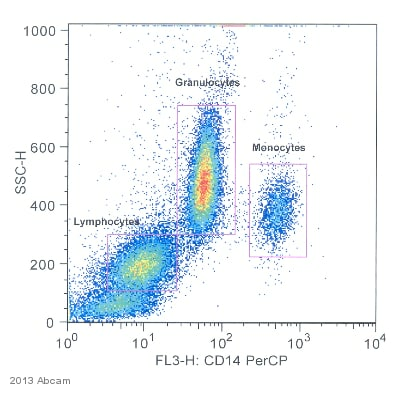 ab91146 staining CD14 in the Human blood cells by Flow Cytometry. Cells were fixed with formaldehyde. The sample was incubated with the undiluted primary antibody for 30 minutes at 4°C. 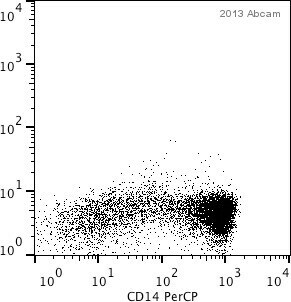 ab91146, at 20µl/106 cells, staining CD14 in normal Human peripheral blood by Flow Cytometry.